Nov. 25, 2017 4:28 p.m.
On Saturday afternoon (Nov. 25), a small group of dedicated volunteers, advocates and community leaders gathered at an awards ceremony to share coffee, conversation and congratulations. Earlier this year, each member of parliament was given twenty pins to award within their riding to those who have made exceptional contributions to country and community. The Canada 150 community awards, hosted by Cloverdale-Langley City MP John Aldag, honoured twenty residents with a special Canada 150 award that included a framed certificate, a letter of congratulations, and a pin made from copper that once capped the roof of the House of Commons. 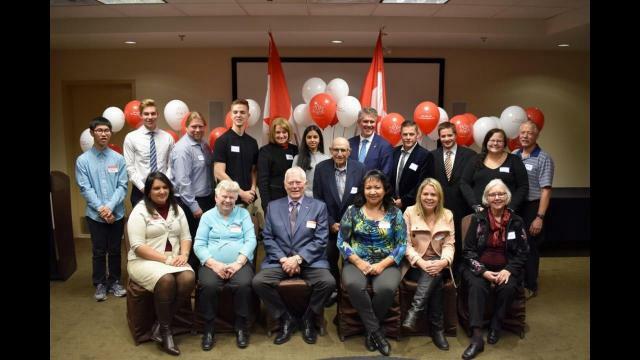 The individuals were recognized for their community leadership, entrepreneurialism, environmental leadership, support for indigenous reconciliation, promotion of equality, diversity and inclusion, and advocation for seniors and youth. They ranged in age from 16 to 92, and included people who inspired at all levels of their community, from “Toots” Tucker, volunteer extraordinaire who always has a hug at the ready, to David Gustafson, was not able to attend the ceremony as he was in Ottawa presenting his work on restorative justice to the United Nations. Twenty members of the Cloverdale–Langley City community received a Canada 150 award. Roger Bose, a member of one of Cloverdale’s founding families, is an avid volunteer for Surrey Historical Society, BC Vintage Truck Museum and the Fraser Valley Heritage Railway Society. Nathan Bowick is a student at Langley Secondary School, is a peer tutor and a member of Grad Council. Last year, he took part in the Youth Homelessness initiative, which successfully lobbied to have shelter beds for youth provided in Langley. Jas Cheema is an immigrant to Canada who now devotes much of her time to cultural communications and health care services. She has served on the Surrey Hospice Board and the Surrey Libraries Board. Marilyn Fischer is an advocate for affordable and accessible housing for seniors. Shelley Goepel works actively in Cloverdale and Langley to advocate for those who are discriminated against. Fraser Holland is a well-known advocate for the homeless. He is a program manager for Stepping Stone Community Services and an outreach worker. Harjot Kular is a Sullivan Heights Secondary student and environmental leader. She is president of her school’s Sustainability Club and an active member of the Surrey Youth Sustainability Network, the Multicultural Club and the Global Issues Club. Peter Luongo was the Langley Ukulele Ensemble’s musical director for more than 30 years. He has served as a teacher and administrator, a Rotarian and a member of the Langley School District Foundation. Dean Moore is a well-known entrepreneur in Cloverdale. He is a partner at Michaud’s Salon Spa Wellness Centre, which has been open since 1994, and a founding director of the Cloverdale Business Improvement Association. Karen Moraes is an advocate for the vulnerable in Cloverdale and Langley, including the community’s aboriginal people. Kevin Penner has been a dedicated leader of Scouts Canada in Cloverdale for more than 20 years. Traci Penner has volunteered more than 20 years to Scouts Canada and Girl Guides Canada. Liam Roberts is a Clayton Heights Secondary student who is a leader, a member of student council and a talented athlete. He recently represented his Clayton Heights at a national leadership conference in Ottawa. Shauna Sawicki is an entrepreneur who owns Salt Lane in Langley City. She is also an active volunteer in the downtown, and a sponsor of the “Start It In Langley” campaign. Joon Hyeong Sohn is a Lord Tweedsmuir Secondary student who is involved with the Teen Library Council and is a Reading Buddy with Surrey Libraries. He also heads the administration and finances of Youth Vision School. Gertrude “Toots” Tucker has been an extremely active member of the Langley community since 1953. Her volunteer accolades include working with the Langley Lodge, the Langley Seniors Centre, the Canadian Cancer Society, the Langley Centennial Museum, the Heritage Society, the Field Naturalists, the Garden Club and many more. Tom Waldock has volunteered with Scouts Canada for decades. He is acknowledged for his ability to inspire and encourage youth, and their parents. Bruno Zappone is still very much involved with charity work in Cloverdale at 92 years of age. He was a volunteer firefighter for more than 40 years, and currently volunteers with the Cloverdale Lions, the Surrey Friends of the Museum Society and the BC Vintage Truck Museum. David Gustafson began the Community Justice Intiatives Association for conflict resolution in Langley more than 30 years ago. He continues to work with youth, to promote social responsibility and work towards indigenous reconciliation. He was unable to attend the ceremony as he was in Ottawa, presenting his work in restorative justice to the United Nations. Mohnish Farswani is an influential Langley Secondary student. He is president of the Grad Council, a member of the Student Leadership Team and a member of the team that brought shelter spaces to Langley’s homeless youth.